This book is very dear to my heart. I worked on it with Renée when I came back to work, after my maternity leave. I was working full-time (stressed and tired!) but knew that I wanted to cook nutritious food for Zoë, Peter and I. But I found that I was focussing on lovely purées for Zoë and then too tired to rustle much up for us. Renée’s innovative idea for cooking for a family made total sense to me – and she taught me to think of recipes that I could make for us and then make a purée for Zoë from. Brilliant! And here, at last, is the book I wish I’d had in my hands back then! Cook up Herb-Crusted Fish, for example, in just 30 minutes from start to finish. While you’re preparing the main dish, you can follow the mini-variation recipes to make a Salmon with Broad Beans & Sweet Potato Purée version for your 6–9-month-old or a Herby Salmon with Broad Beans & Sweet Potato Purée for your 9–12-month-old. In this book you’ll find recipes for all situations, including quick breakfasts and lunches for everyone, indulgent, romantic dinners (yep!) to have with your partner after you’ve fed your little angels, bathed them and read them their favourite stories, and meals you can cook for friends when you actually get your social life back! What’s more, these recipes are bursting with goodness. Renée is all about adding nutrition whenever you can. So you’ll find inspiration for those health food products you’ve never known what to do with, as well as ways to make things like chocolate brownies actually healthy. In this recipe, you use super-healthy sardines instead of the more usual salmon/cod. Sardines are hard to get little ones to eat as they taste fairly strong but made this way, you’ll be able to. (Zoë won’t eat fresh or tinned sardines but she loves making these (hence the less-than-perfectly-shaped fishcakes in the picture!) and will then gobble them up.) Sardines, like all oily fish, are full of omega-3 so they’re wonderfully good for boosting brain development. 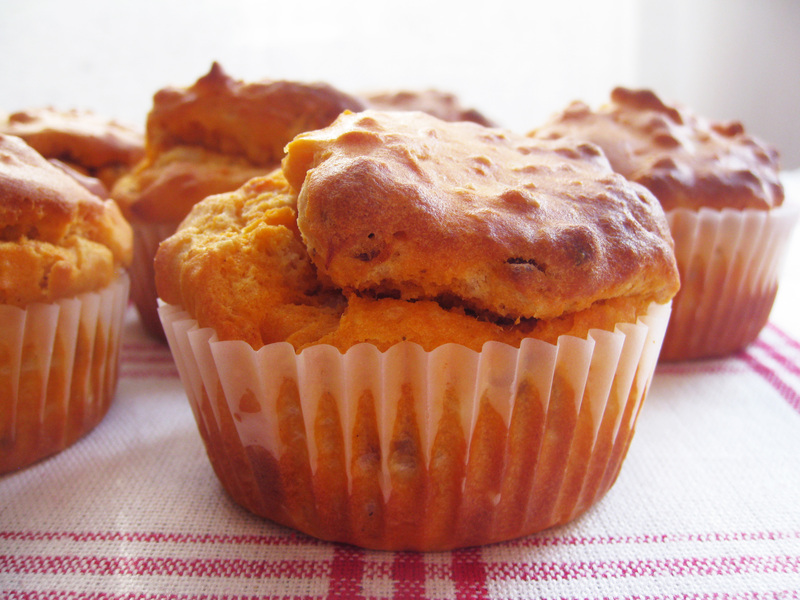 And, of course, they’re a great storecupboard ingredient so you can whip these up with minimum hassle. I changed the breadcrumbs to gluten-free breadcrumbs (which you can make very easily by putting some bread – crusts and all – into your food processor and whizzing a little). or until soft. Transfer to a large bowl and mash coarsely. Mash the sardines with a fork in a mixing bowl. Add the eggs, onion, mustard, parsley, lemon zest, cayenne pepper, salt and breadcrumbs and mix well. Add to the mashed potatoes and mix until well combined. 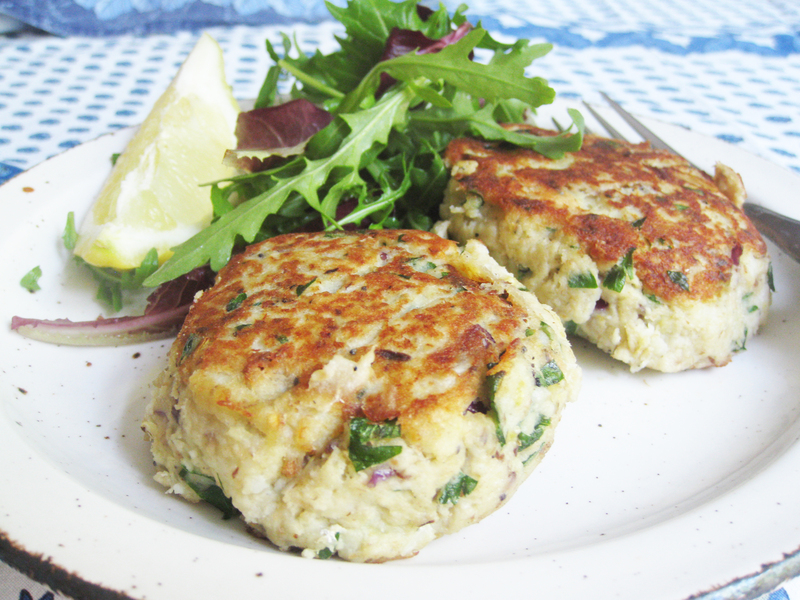 Using your hands, divide the mixture into 10 equal pieces and shape each one into a fishcake. Heat the oil in a large, heavy-based frying pan over a medium-low heat. Working in batches, carefully add the fishcakes to the pan and cook for 3 minutes on each side until browned and heated through. Repeat with the remaining fishcakes, adding more oil to the pan as needed. Serve warm with lemon wedges and salad. Put 4 of the sardines and 3 tablespoons water in a blender. Blend for 30 seconds, adding extra water 1 teaspoon at a time, until smooth. Serve warm. Heat 1 teaspoon of the oil in a heavy-based frying pan over a low heat. Add 1 teaspoon of the onion and cook for 10 minutes until completely soft. Transfer to a blender and add 4 of the sardines, 1 teaspoon of the parsley and 3 tablespoons water. Pulse for 15 seconds, adding extra water 1 teaspoon at a time, until the mixture forms a lumpy purée. Serve warm. Last night I made a recipe from Christine Bailey’s new book The Raw Food Diet. A raw food diet is increasingly recognised as a superhealthy way to eat (and followed by many celebs, including Jennifer Aniston and Demi Moore). Raw food is basically food that hasn’t been heated above 47.7°C/118°F. It’s all about pure, unadulterated, whole food that is rich in vitamins, minerals, enzymes and phytonutrients – mainly from lots of veggies (especially green leafy ones), fruit and nuts. Processed or refined foods are out, and alkaline foods and drinks are in, especially those that are nutrient-dense, such as kale. And by not cooking any of the food above 47.7%, the valuable enzymes are preserved. Raw foodists swear that their diet improves their digestion and immune function. Many lose weight and say that their skin and hair looks much better, and that their energy levels are much higher. They also claim that it can bring relief to allergies and intolerances, as well as reducing the risk of heart disease, diabetes and other chronic conditions. You don’t have to follow a raw food diet 100% of the time. It makes sense to eat food in its natural state and devotees reckon that even if you can only eat 40-50% of your food raw, this will make a huge difference to your health and wellbeing. I made Christine’s Kelp Noodles with a Chilli Lime Dressing. I’ve never tried kelp noodles before but I’ve been wanting to try them because they’re so good for you. Kelp noodles look and taste very similar to glass noodles and are simply made of the sea vegetable, kelp, and water. They’re beloved by many people, including raw foodists, as an alternative to pasta or noodles because they are totally unprocessed don’t need to cooking, (People looking to lose weight also love them because they’re very low in calories and carbohydrates.) Plus, kelp is a true superfood, like all sea vegetables. It’s rich in minerals, including iodine, plus enzymes, potassium, magnesium, calcium, iron and amino acids. It’s also very cleansing and detoxifying for the body. 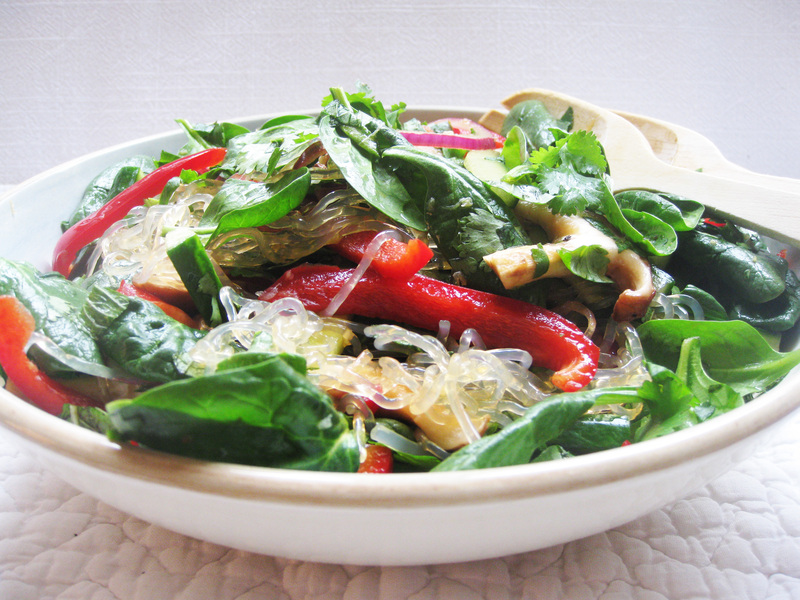 Kelp noodles have a very mild taste and soak up flavours beautifully. In this recipe, Christine has added delicious shiitake mushrooms, red pepper and cucumber and created a strong, vibrant dish, full of punchy flavours, especially from the chilli lime dressing. This recipe uses dried kelp noodles, but I used noodles that were immersed in water and sodium alginate, so I didn’t need to soak them. Mix together all the dressing ingredients in a bowl, then chill until needed. Put the onion, mushrooms and pepper in a bowl and toss with the dressing. Leave for 10 minutes to soften. Add the rest of the ingredients and mix well.